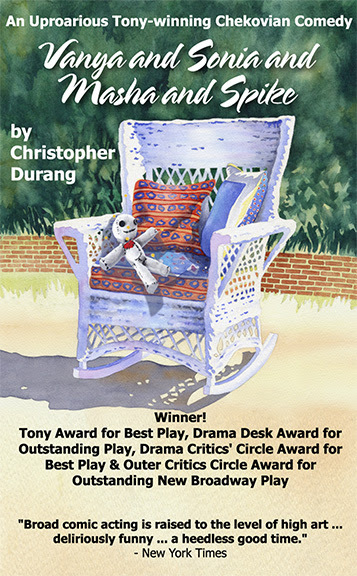 A witty mashup of Chekhov’s Uncle Vanya, The Seagull and The Cherry Orchard, Durang’s off-kilter romp is set in bucolic Bucks County, PA. There, middle-aged siblings Vanya and Sonia have frittered their lives away in the family farmhouse full of regret, angst and the alarmingly ambiguous prophecies of their addled house cleaner Cassandra. Enter their sister, self-absorbed movie star Masha, with her prized 20-something boy toy Spike, and the stage is set for an absurd weekend of abundant comic twists that pays loving homage to Chekhov’s classic themes of loss and longing. For more information, check out: www.InternationalCityTheatre.org.